When a society seems perfect, it’s probably time to start worrying. That’s part of the warning delivered by The Giver, an artful if slightly bland adaptation of a 1993 young adult novel by Lois Lowry. 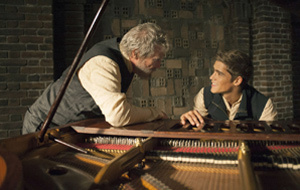 Carefully assembled by director Phillip Noyce and boasting strong adult participation from Jeff Bridges, Meryl Streep, Alexander Skarsgard, and Katie Holmes, The Giver serves as a well-made — if too familiar — cautionary tale about the perils of an over-controlled society that has tried to eliminate all knowledge of the past. You needn’t have read the book to know that someone — in this case a young character named Jonas (Brenton Thwaites) — eventually will challenge the prevailing order. The story begins when young Jonas is selected as the Receiver of Memory, the one person who’ll learn the real history of humanity prior to its imprisonment in this apparently idyllic world. Jonas is introduced to memory — and the pain it brings — by The Giver (Bridges), a grizzled fellow who’s allowed to know all of human history. Because he possesses such knowledge, The Giver occasionally is called upon to advise the ruling elders about potential dangers that need immediate redress — or something like that. The Giver also has the power to transmit images from the past simply by grabbing Jason’s arms and establishing a mind link, thereby saving his charge the trouble of having to read any of the many books in The Giver’s vast library. The movie opens at a ceremony in which Jason graduates into his adult role. His two best friends: Fiona (Odeya Rush) and Asher (Cameron Monaghan) are assigned their tasks, as well. Jason’s parents (Skarsgard and Holmes) watch the proceedings along with the rest of the parents, who aren’t biological parents but adults selected for parenting roles. Streep plays the Chief Elder, a woman with a school principal’s smile and a hair style that looks as if it were borrowed from Cher. The chief elder keeps order by eliminating most of what we regard as human impulse. Noyce shoots segments in the movie’s sterile, smiley-faced utopia in black and white, introducing vivid color as Jason begins to see a more flavorful but dangerous world under The Giver’s tutelage. Of course, the colorless world in which all homes are the same and in which daily injections suppress both positive and negative emotions harbors hidden dangers. Babies judged “inferior” are killed, as are some of the elderly. Looking like The Dude after a weird makeover, Bridges — also one of the movie’s producers — adds gravitas, and Streep avoids Cruella de Vil cliches in a role that isn’t likely to be pressed into her book of memories. The young actors give serviceable enough performances. Skarsgard and Holmes are short-changed by the fact that they’re playing characters with minimal personalities. The movie unravels a bit during an ending that underscores the story’s implausibilities, and the tale’s main issues hardly qualify as startlingly original. The Giver comes off as a well-intended helping of sci-fi built around a moral lesson: The problem with eliminating all of our worst tendencies is that it also does away with the best. That, of course, proves little aside from demonstrating that The Giver has a firm grasp of the obvious.